With the birth of the royal baby imminent, I can't help but reflect on the two years that have gone by since the birth of Kate and William's first child, Prince George. Some of you may know that it was the scathing attitudes of the press to her plans for a natural birth in Kate's last pregnancy that landed me my current job as a columnist for Best. 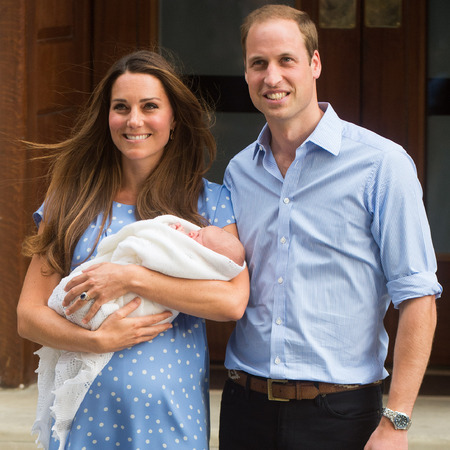 I wrote an observational piece 'Is Kate being bullied about her birth? ', in which I wondered why the world was so quick to pour scorn on the idea that birth can be done naturally – or even – shock horror – be a positive experience. The article went viral – a sure sign that I'd hit a nerve. I'd like to think that it challenged some attitudes, but of course, I can't take all the credit. It was Kate herself, who in her very English and understated way, held up a victory V to her critics when she emerged from the Lindo wing looking the picture of health and happiness – it certainly seemed like she'd had a brilliant birth. She even dared to challenge another outdated and sexist stereotype by allowing a little silhouette of her post-baby body to be visible, instantly getting the world talking about the reality of birth and motherhood. I think that in two years, the world has made some real progress when it comes to attitudes to birth. In fact, I'm not sure I've seen anyone – in the press at least - sniggering about natural birth plans since, and it seems to be more common for celebrities to talk about everything from water birth to doulas to placenta encapsulation without being completely derided. "The baby will be delivered by a team of doctors"
This phrase has been in many reports on the royal birth but it's not just about the royal birth. In fact, you often see news stories of babies who were 'delivered by a team of paramedics' because mum didn't make it to the hospital on time. Oh sure, these are just words, but the iceberg that lies beneath them is all about the true nature of childbirth – is it something that women do? Or something that other people do to her or for her? If we must use the word delivered at all – because surely it's more suitable for pizzas than babies – then it's Kate who'll do the delivering. And as for the team of doctors, well let's hope they're down the hall reading a bit of Kitzinger or playing Sudoku, while the midwives make crocheted crowns in the corner of a darkened birth room, and the baby emerges calmly into royal hands. Whilst the Lindo wing might have room service and champagne on ice, from the photos it looks like it's not a million miles from your average delivery room. Here's hoping that Kate has had the bed moved to the side and had a luxury birth pool, yoga balls and mats and maybe a comfy chair or two placed centre stage, because surely, in the 21st century, we need to consign the idea that birth takes place on a bed to the history books? It was after all rumoured to be another royal, King Louis XIV, who started the trend of women lying down to give birth. He wanted to watch so instructed his mistress to get on the bed while he hid behind a screen. The doctors apparently loved it too as it made their lives easier, a royal trend caught on, and the rest is history. Being on the bed turns labouring women into 'patients', makes it harder for babies to get out, makes labour longer, more painful, and more likely to end in intervention. It might have worked for King Louis, but surely, three hundred years later, it's time to move on? Just like the last royal baby, there's been a real press panic about the actual actual ACTUAL due date. There's seems to be a really genuine conviction that babies pop out suddenly and without warning on the precise day you'd been roughly expecting them to. If dad's planning on going to a polo match or popping out for a pint of milk, he'd better not do it on the due date, or he'll certainly MISS THE BIRTH!!! In reality, babies don't tend to come flying out before you've even managed to take your tights off. The majority of women get plenty of warning, and labour can begin with little niggles then develop slowly over hours or even days. And as for the due date – only about 5% of babies arrive on it – the rest are 'early' or 'late'. Unfortunately the due date myth can put a lot of rather toxic pressure on heavily pregnant women, and many end up being induced just a few days later. It was interesting recently to see this Horizon documentary on induction from 1975 – and it leaves you wondering, how will we feel about post-dates induction and what will the policy be when the William or even George is on the throne? We can only speculate about how much freedom Kate has in her birth choices, but let's hope it's at least as much or more than the average UK woman, who can be heard, all too often, to utter phrases like, "They let me…" or, "I was not allowed…" We are still in a rather nightmarish twilight zone between the 'doctor-knows-best' 70's and the Future, in which women – not often known for taking it lying down – are sometimes completely unaware that they have the right to say no. Yes – you heard it here first, whether it's induction, or a V.E, or a sweep: you are 'allowed' to accept or decline any procedure: it is your body, your baby, your choice. Perhaps this attitude that labouring women must just lie back and think of England is a throwback to the days when the Queen was seen as merely a vessel for providing a healthy heir, so much so that if, like Anne Boleyn, she didn't - she was considered entirely disposable. Whatever the reason, it's time for consent in birth – along with the dignity and respectful care that naturally accompany it – to be placed much higher on everyone's agenda. The birth of Kate and William's baby will soon make history: it will be interesting to see what history will make of the way Kate – and all of us – birth (not deliver) our babies. BestDaily columnist Milli Hill is the founder of The Positive Birth Movement. Her latest book is available on Amazon.